The Denny Triangle in central Seattle used to be a steep hill, but it was leveled in the early 1900's. The area of The Denny Triangle is commonly misnamed for its trendier pocket nabe, Belltown. Incredibly urban in character, The Denny Triangle has been the subject of heavy change as Seattle settles into the 21st century. Brick warehouses converted into lofts mingle with steel and glass high rises and upscale restaurants fill a nabe that once was the epitome of urban decay. This nabe is on a meteoric rise to stardom. I work in Denny Triangle. While I love all of Downtown Seattle, I enjoy working on this end of town because it’s clean, safe and not in-the-thick-of-it (read: less tourists, panhandlers, cause marketers, etc.). While I try to walk to/from work each day (and the walk between here and Lower Queen Anne is a breeze), there are so many transit options, it boggles the mind (busses both local and seemingly from the east side, streetcar, monorail…light rail is close…it’s also really easy to catch a cab and/or park your car as well)! As a single gal, I have considered either renting or buying a place in the neighborhood – lots of cool, new options! I feel I need a physical separator between work and home, so I choose to live just adjacent to Downtown. – There is a vibe among workers and residents that this neighborhood is going to boom soon, that it’s best to get in now. 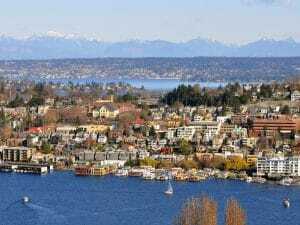 Ideally situated next to the South Lake Union, Lower Queen Anne and Downtownnabes, Denny Triangle has all the advantages of urban life without the noise and clutter. It’s just out of reach of the drunk, the high, and the high-on-life activists yet close enough to smell the piroshkies and donuts. Want to de-stress after a long week? Consider Barolo, Twist, Amber, or one of the many of the other bars in the Belltown area. So bored you’re wondering if M&Ms DO actually melt in your hand and not your mouth? Catch a show at the Market Theater for some live entertainment, or grab a beer at Big Picture Cinemas while taking in a flick. Into something a bit more active? Take a walk by the water near Olympic Sculpture Park or stroll around Lake Union. And if you’d rather exercise your credit card than your legs, try the stores in and around Pacific Place and Westlake Center. If you need to get around during the day, downtown Seattle has buses that go virtually anywhere in the Puget Sound area. You can either walk to downtown, or catch theSouth Lake Union streetcar. It costs $2, but you can use your metro bus transfer. Within downtown, the buses are free from 6am to 7pm. The great location comes with what some may consider a steep price tag. Rent easily costs $1000-$1500 for a single person. Many of the newer LEED certified buildings may lower the cost of some utilities, but doesn’t much affect of the overall price. Parking spaces also come at a premium; if you don’t need to drive to work, consider foregoing car ownership. All that being said, these high-rise apartments have excellent amenities and provide a safe, fun place to call home. Denny Triangle is well suited for the young, single professional with some disposable income. 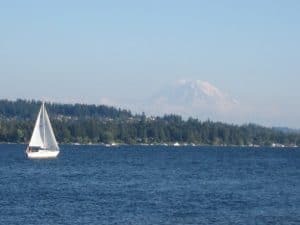 With the up-and-coming South Lake Union neighborhood to the north and the established downtown area to the south, Denny Triangle has the potential for development that can only improve its appeal. 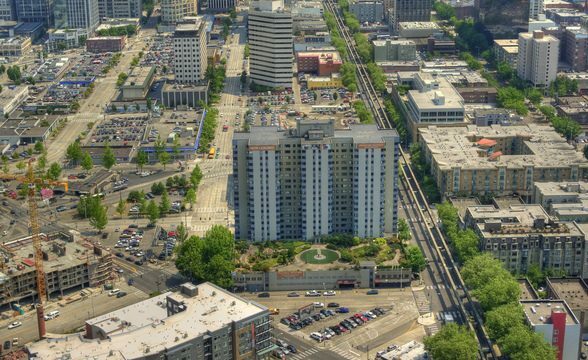 The Denny Regrade, So titled for filling the void left by the removal of one of Seattle’s original seven hills, is a nabe of sharply urban character and smoldering contradiction as it begins to fully gentrify. Located just north of the CBD, this nabe contains one of Seattle’s oldest neighborhoods, Belltown, and is quickly becoming a hotspot for the rich looking for close in living, as well as the more bohemian artist types who are drawn to the vast array of music venues and galeries, and cheaper housing inBelltown. Sky grazing modern condominium buildings seem to be going up at a rapid pace, which has recently brought in a large number of high class restaurants, bars, and nightclubs, slowly replacing the seedy dive bars and cheap food-stands that used to populate the area. The Belltown area of this nabe seems to be resisting the gentrification process for now, and still maintains its seedy and bohemian vibe. 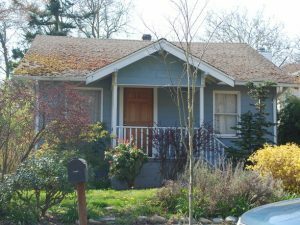 However, the rest of the Denny Regrade is experiencing escalating prices in rent as well as general cost-of-living. If you can afford to live in one of the new high-end condos in the area, then you could do much worse than to move here. The area’s nightlife sparkles with new bars and creative nightclubs, as well as some truly stunning restaurants.